Click here for RealAudio comments by the composer, [not yet available]. 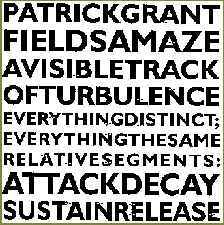 Click here for RealAudio 3 stereo version of Fields Amaze, 8:35. Click here for RealAudio 3 mono version of Fields Amaze. Click here for RealAudio 2 mono version of Fields Amaze. He was born in Detroit, Michigan in 1963. He was drawn to the visual arts and won prizes in art competitions. He put aside this interest at age eleven when he heard the electronic Beethoven in the soundtrack for "A Clockwork Orange" and decided from then on to devote himself to music. He studied piano, violin and viola and began privately studying theory and counterpoint with graduate students of the University of Michigan. At age fourteen his piano teacher arranged a performance of his highly baroque Cantata for the Easter Mass on Easter Sunday 1978. This piece won a special prize from the Detroit News Scholastic Awards. At sixteen he was accepted as a composition student at Wayne State University in Detroit, where he eventually enrolled as a freshman in 1981. At WSU he sang as a baritone in the world champion WSU Men's Glee Club and outside of school he played synthesizers in new wave musical groups. He put school on hiatus after the second year and worked in the family trade (which is pattern and model making) to save up to move to NYC. 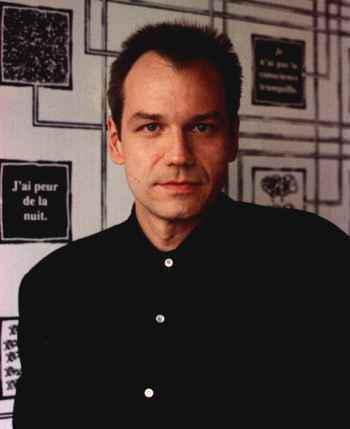 He regards his family's involvement with patterns, blueprints and models as integral to his development as a composer. In 1985, at age twenty-two, he moved to New York City where he worked as a radio car driver. He wrote music for Lower East Side theater groups. Moving into musical employment, he worked for The American Composers Alliance and C.F.Peters. He attended night classes in composition at the Juilliard School Extension under Stanley Wolfe and Lawrence Widdoes and founded a composers collaborative called Silent Treatment which had three seasons of downtown performances of his and other artists' works. In 1990 he supported himself by writing for Manhattan Cable TV, especially, music and copy for the notorious Channel 35 where he was an anonymous presence. Later that year he was introduced to Judith Malina of the Living Theatre and became their music director/composer for three years until 1993. His opera The Rules of Civility, whose libretto is a found text by George Washington and conceived/directed by Hanon Reznikov, has had over 150 performances throughout the U.S. and Europe. In 1993 he went to Bali for some months and studied with master musician I Wayan Lantir, son of Grindem, a teacher of Colin McPhee, in Teges Village. There he learned gamelan technique and other Indonesian art forms. He has applied this knowledge by writing and performing with Gamelan Son of Lion, NYC's new music gamelan founded by composers Barbara Benary, Philip Corner and Daniel Goode. He has received grants from Meet the Composer and has had commissions and performances from various musical groups. Among them: The Harvard-Radcliffe Contemporary Music Ensemble, NYC's Music Under Construction, and Switzerland's Prix de Lausanne International Concours for Dance ('95 at the Bolshoi in Moscow, and in '96 & '97). In January 1997 he gave the first all evening concert of his music at Context Studios. In 1998 he founded the Patrick Grant Group, a protean ensemble made up of roughly 3 synthesizers, flute, clarinet, viola, cello, guitar, bass, and 2 percussion including instruments from the Indonesian gamelan. Also formed was the production company sTRANGEmUSIC iNC., an organization dedicated to the making of recordings, videos, and the presenting of concerts of his music (info@strangemusic.com). In 1999 his ensemble performed in NYC at the Bang On A Can Annual Marathon, the American Festival of Microtonal Music, and always has regular performances at The Knitting Factory NYC. In 2000 they performed at the Annina Nosei Gallery, Performance Space 122 and at the Brooklyn Academy of Music. In January 2001 he will launch his website www.strangemusic.com to promote his work and production facility, sTUDIOsTRANGE.